Sarson ka Saag: Sarson da saag or Sarson ka saag is a popular vegetable dish in the Punjab region of India and Pakistan, made from mustard leaves and spices. However, it is also popular in other neighboring states of Haryana and Rajasthan. It is regarded as the traditional way of making saag, and is traditionally served with makki di roti, which literally means corn bread. It can be topped with either butter or more traditionally with ghee (clarified butter). Wash all the green leaves separately under running water. Chop all the greens leaves. Add all the ingredients under “For Saag” except for maize flour, in a pressure cooker. Cover the pressure cook and cook for 10 minutes. Remove the contents of the pressure cooker and pour it into the blender with the maize flour. Pour the pureed greens into the hot pan. Simmer for about 25-30 minutes. Heat the oil in another pan, on medium heat. Add in the reduced puree. Stir and simmer for a couple of minutes. Sarson ka saag is ready to be served. Serve sarson ka saag hot with some chopped onions, whole green chilies and a dollop of butter on the saag with makki di roti. 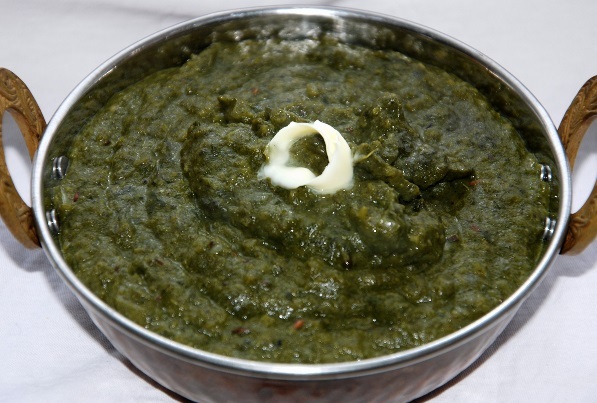 If you have any queries regarding the Sarson ka Saag recipe, please leave a comment.